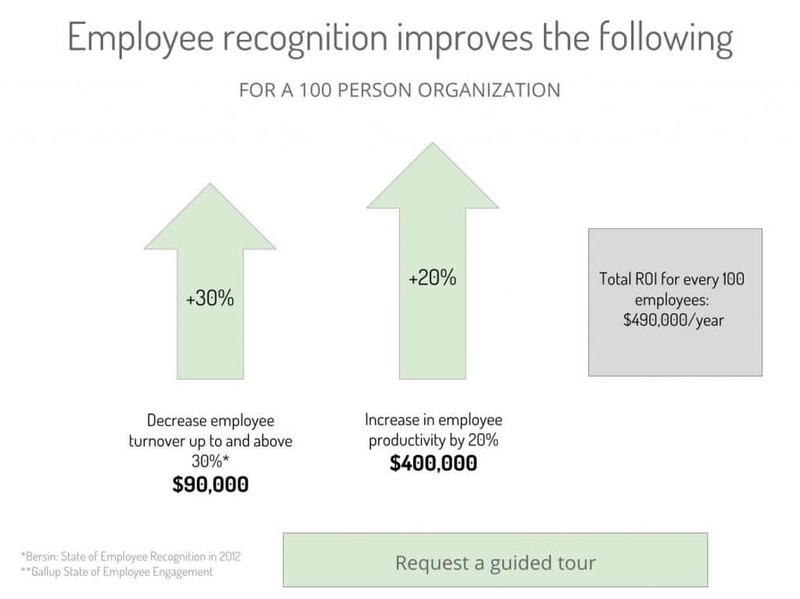 Yes, that number is correct — an eye-popping employee turnover rate of 400%. But rather than settling for the kind of employee exodus that’s typical in their industry, Jancoa Janitorial Services found a different path. Faced with an employee shortage, the company took the opportunity to reassess its approach. That process resulted in creating an enviable culture that meets the needs of employees as well as customers. That employee engagement strategy can be tailored for any business. Much of that success can be credited to CEO Mary Miller, a widely lauded entrepreneur and author, who’s guided the company to annual sales exceeding $15 million with more than 500 full-time employees. Over the past three years, revenues have increased by 5-10% annually. Miller joined Jason Lindstrom of Bucketlist to talk about how she helped Jancoa overcome that 400% turnover rate to become a company with highly engaged employees. They presented a webinar on how to create an award-winning culture and engage top talent. 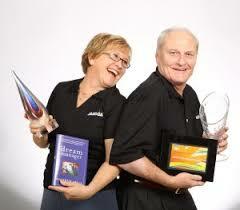 Jancoa CEO Mary Miller with her husband Tony, who founded the award-winning company in 1970. Despite her current success, things didn’t start out so well for Miller. 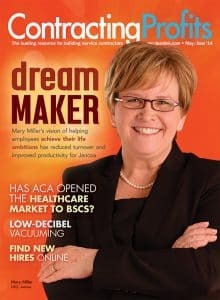 Miller shared her own unlikely rise in the business world. “I was never one of those people who dreamed of being an entrepreneur,” she explained. Instead, she said, “I was one of those people who was addicted to eating” — her tongue-in-check way of explaining that she needed to find a way to feed her family and pay the bills. The year Miller turned 30, she dealt with a series of events that would have tested the sturdiest of souls — a bankruptcy, her second divorce, and the loss of two jobs, all while trying to keep food on the table for three young children. Miller knew she had to make something happen, and she had the perseverance to achieve it. As it turned out, she’s a gifted sales person. That skill that helped her overcome those early obstacles and prepared her for the road ahead. It wasn’t long before she met Tony Miller, who had founded a janitorial services company when he was 19 years old. Soon they were not only married, they were in business together. But Jancoa had all the problems every cleaning business has — including that 400% turnover rate. It was an average cleaning company with typical problems. But Miller did something not so typical: She made a conscious choice to stop being average and become the best. What did they need to do to make people want to work there? Once they hired those employees, how should they train them to do the job? Once those employees have been trained, what could be done to make sure they would stay long enough to recoup the investment? Since its beginning, Jancoa has been a company that focuses on customer service, setting it apart in an industry Miller said is more known “for making excuses.” While that philosophy served them well, Miller realized they needed to expand that attitude. That’s when Miller asked the question that shaped the company’s future: “What if we treated our employees the same way, with the same value, as our customers?” she wondered. The result has been a “culture of caring” that takes into account the needs of their employees — a shift in mindset that’s delivered an ROI many companies would envy. One of the first things Miller and her husband realized was that transportation was a critical need for many of their employees. So they bought a 15-passenger van and began shuttling employees to and from work — with Tony Miller behind the wheel. Soon he began to hear their stories and recognize their needs. 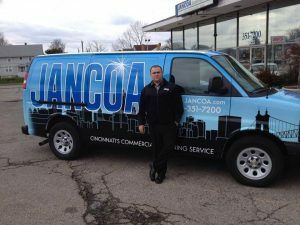 A Jancoa employee stands beside the company’s van. Providing transportation is one way to provide the support team members need to perform their jobs. 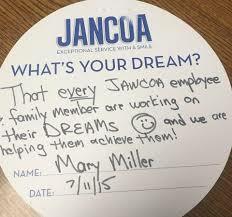 Mary and Tony Miller quickly realized that if they wanted their employees to be committed to Jancoa, those employees needed the support to be able to do that. So in addition to helping with transportation, the company began encouraging workers to pursue their personal dreams — ranging from buying a home to learning a language to earning a degree to starting a business. That led to the company’s Dream Manager program, and then to a best-selling book, The Dream Manager by Matthew Kelly. Mary and Tony Miller discussed both the program and the book in an interview with marketing guru Joe Polish. For Jancoa, the results of their culture shift have been dramatic. Miller doesn’t have to do much promotion these days because the company’s reputation precedes her with word-of-mouth advertising from customers and employees. “Our best people come from our people,” she said. Currently, 57% of new hires come from referrals by current employees, and 17% come from referrals by previous employees. Know your people. At Jancoa, employees work at several locations with various shifts. To help overcome that, they hold an annual “family picnic” for all employees. Be committed. People will not believe you’re serious, Miller said. So you have to prove that it’s not just another new HR phase. She suggests companies create a vision of where there want their culture to be, say 3-5 years down the road, then reverse engineer what they need to do to make it happen. When it comes to incentive programs, Jancoa offers a referral bonus for their employees as well as a bonus for the new hire to stick it out through the rocky beginning period. A program like Bucketlist’s rewards and recognition platform can also help employees achieve their life goals. 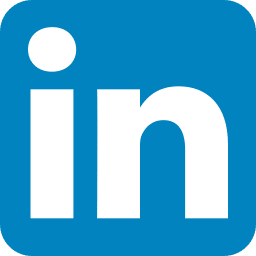 “That is a great tool for companies to be able to tap into — to find out what do their team members want and how you can support them,” Miller said. Ultimately, Miller said, creating the kind of culture that fosters employee engagement starts at the top. She paraphrased business icon Warren Buffett about the need for transparency.